William Stafford, one of the most beloved American poets of the second half of the 20th century, was also one of the most prolific. His secret? Get up in the dark, brew a cup of coffee, stretch out on his yellow sofa and write a poem every morning. When Stafford died in 1993, Robert Bly, his friend and colleague, took up the practice as a tribute to the older poet, whom he had begun to recognize as a mentor. Bly's new collection Morning Poems is the first harvest of that loving and often verbally agile discipline. Has given me the sweetness that I confuse with Her . . . . The joy of being alone, eating the honey of words. 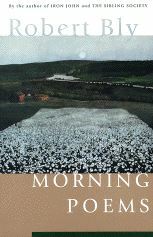 Celebratory, meditative, whimsical, biting, and sweet, Morning Poems stands as one of Bly's most deeply satisfying collections for its range, variety and success in weaving together the varied strands of a fascinatingly intricate sensibility. This book shines like a cloth of many colors. Stafford, wherever he is now, must be applauding Bly's adoption of a practice that has borne such handsome and delightful fruit.